Located in Jamestown, in California’s Gold Country, Railtown 1897 State Historic Park is home to the Historic Jamestown Shops and Roundhouse of the Sierra Railway. This one-of-a-kind attraction combines industrial heritage and railroad history with the lore of Hollywood’s film industry. The Railtown 1897 Interpretive Center, the authentic roundhouse and shops, and the Depot Store (a railroad specialty gift shop) are among the Park’s unique year-round offerings. Steam train rides are offered weekends during the spring, summer, and fall. Known as “The Movie Railroad,” Railtown’s survival has been aided by the film industry. The first known filming was in 1919, for a silent serial called “The Red Glove.” Railtown 1897 and the historic locomotives and railroad cars preserved here have appeared in more than 200 films, television productions, and commercials. Still a popular Hollywood location site, Railtown 1897 has been called “the most photographed railroad in the world.” “Petticoat Junction,” “The Wild, Wild West,” “High Noon,” “The Virginian,” and “Unforgiven” were all filmed here. Recently, movie crews produced the railroad sequences in “Back to the Future Part III” at Railtown. 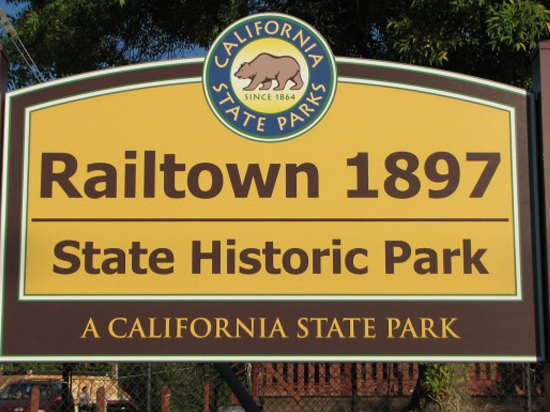 The California State Railroad Museum (CSRM), headquartered in Old Sacramento, assumed responsibility for Railtown 1897 State Historic Park on July 1, 1992. Since that time numerous improvements have been made, including stabilization of aging buildings and the addition of automatic sprinklers in historic wooden structures (such as the roundhouse and machine shop). Major facility upgrades took place in 1996, when the CSRM Foundation invested in a new Depot Store and Interpretive Center, among other improvements. A visit to Railtown 1897 State Historic Park offers a taste of railroading and film history unlike any other.